Author: Peter Levens and Nicolas Labrosse at the University of Glasgow, Brigitte Schmieder at the Observatoire de Paris and Arturo López Ariste at IRAP, Toulouse. On 15 July 2014, a quiescent prominence was observed by several instruments, both ground and space-based, as part of an international campaign. THEMIS, in Tenerife, was used to collect spectropolarimetric information about the prominence, along with the IRIS, Hinode, and SDO satellites. The prominence, as viewed above the limb, has two legs – ‘columns’ of cool, dense material, seen as dark silhouettes in AIA coronal filters. These columns also appear bright in some spectral lines, notably H-α, He I D3 and Ca II (Figure 1), but are not visible in the IRIS Mg II slit-jaw images. Figure 1. The prominence as seen by AIA (a), SOT (b), and IRIS (c) on 15 July 2014. The two dynamic prominence legs are easily identified in AIA and SOT, but not in IRIS. There are still open questions regarding the structure of the plasma and the magnetic field in prominence legs, and this nugget aims to investigate the topic further. The THEMIS telescope provides information on the four Stokes parameters – I, Q, U and V – from which a number of characteristics of the magnetic field of the prominence can be inferred. In these observations the He I D3 line was used. Figure 2 presents the results of the inversion of the Stokes profiles, showing intensity, field strength, inclination and line-of-sight azimuth for the scanned area on 15 July 2014. This prominence has a relatively large field strength in its two legs – up to 50 Gauss. Results for the inclination suggest a largely horizontal field, although there are many pixels where the angle with the local vertical is rather different from 90°. Some light on this apparent paradox is shed by a careful inspection of the results from the inversion code, which reveals that pixels with significant deviations from a horizontal magnetic field also have associated errors larger than 30° . 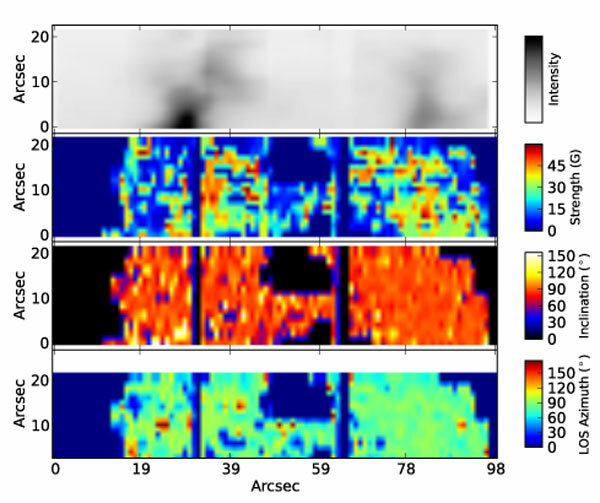 This suggests that there is a turbulent field component to the horizontal field, as these observations cannot be reconstructed simply using a single field component per pixel . Figure 2. Results from the inversion of the THEMIS spectropolarimetry. From top to bottom: Intensity, field strength, inclination and local azimuth. Figure 3. Comparison of Ca II (upper curve) and Mg II (lower curve) intensities for a cut through both prominence legs. 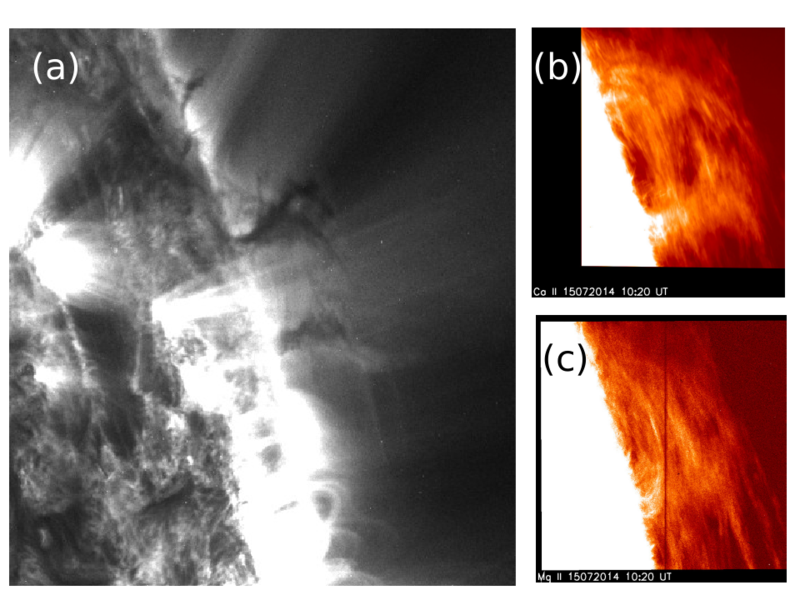 Looking together at data from Mg II (IRIS) and Ca II (Hinode/SOT) provides an interesting insight into the similarities and differences between these optically thick lines in prominences. Figure 3 presents a direct comparison between Hinode/SOT Ca II 3968.5 Å (upper curve) and the Mg II 2796 Å slit-jaw of IRIS (lower curve) for a slice through both legs of the prominence. 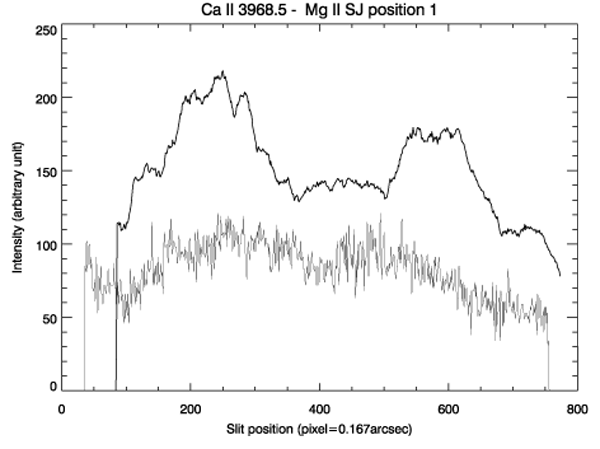 In the Ca II cut there are two peaks, one at each of the locations of the prominence legs – a pattern which is not visible at all in the Mg II emission. Why don’t we see a similar behaviour in Mg II and Ca II? The prominence plasma is more optically thick in the Mg II lines than in Ca II, and the Mg II line profiles will be more reversed. The contrast between the prominence legs and their surroundings (in particular the system of loops seen in the foreground) will be less in Mg II than in Ca II. Figure 4. Examples of the Mg II k and h lines for three slits in one of the IRIS rasters from 15 July, corresponding to different heights in the prominence. The two sets of arrows indicate the positions in the SOT image where the Ca II intensity is the largest. In spite of the fact that the two prominence legs are not easily identified in the Mg II observations, i.e. we can only see cool loops of material in Mg II, we do see differences in the spectra at the locations of the bright Ca II columns. Figure 4 shows examples of the Mg II k and h lines as seen by IRIS at different positions in the raster, and different heights in the prominence. The leftmost spectra are from nearest the limb, with the right hand spectra coming from the very top of the prominence. The white arrows indicate the brightest parts of the SOT image at each slit location. Although the spectra have a mix of reversed and non-reversed profiles (as also seen in ), those that are at the locations of the SOT brightenings are all reversed. These locations also correspond to the brightest parts from the THEMIS intensity image, which present the strongest magnetic field components. The increased central reversal of Mg II will mean a decrease in overall intensity at these locations. Rather than the profiles being enhanced, as may be the case without central reversal, these parts of the prominence will be relatively dark, in this case bringing the intensities down to a similar level to the non-reversed profiles. Some regions of the prominence legs have large errors in the inferred values of the magnetic field inclination. We conclude from this that the magnetic field model of one field per pixel used by the inversion code is not valid. We can definitely exclude a vertical field as solution, which would have been correctly inverted. Several possibilities mixing several magnetic components as in the case of the prominence have to be explored . Line profile shapes (when available) and intensities of the optically thick Ca II and Mg II resonance lines are complex to interpret. We can, however, clearly see correlations which need to be carefully analysed in the context of non local thermodynamic equilibrium radiative transfer calculations to model their formation . The combination of spectropolarimetric data from THEMIS, spectroscopy from IRIS, and high- resolution images from AIA and SOT, shows great potential for new diagnostics of prominences . López Ariste, A., 2015, Proceedings IAU Symposium no. 305. Schmieder, B., Tian, H., Kucera, T., López Ariste, A., Mein, N., Mein, P., Dalmasse, K. & Golub, L., 2014, A&A, 569, A85. Heinzel, P., Schmieder, B., Mein, N. & Gunár, S., 2015, ApJL, 800, L13. Schmieder, B., López Ariste, A., Levens, P., Labrosse, N., Dalmasse, K., 2015, Proceedings IAU Symposium no. 305. Levens, P., Schmieder, B., Labrosse, N. & López Ariste, A., 2015, in preparation.